These techniques can be used to attack and break into WordPress based websites. By providing details on these types of attacks the aim is to raise awareness about the need for hardening and security monitoring of WordPress. Of course any penetration testers wishing to pop a WordPress based site may also find some helpful pointers in this guide. WordPress is the application behind close to 20% of all websites. Its ease of use and open source base make it such a popular solution. The numbers of installations keep growing; there are literally millions of WordPress installations. This popularity makes it a juicy target for bad guys aiming to use a compromised web server for malicious purposes. Also keep in mind that if you use a managed WordPress hosting service, some of these attacks (and mitigations) will be the responsibility of your hosting provider. If you are self hosting on an unmanaged VPS then security is your responsibility. Ok, ready to start? Lets get cracking. The first step in attacking a WordPress site involves gathering information about the installation. To begin with we want to get an idea of how well maintained the site is; determining whether the site is running the latest WordPress core version is a good start. The two fastest ways to discover the core version of the WordPress site is to check the HTML source of the page for a meta generator tag in the HEAD of the source or the examplesite.com/readme.html file that is distributed as part of the core installation files. If the meta tag has been disabled, check for the presence of /readme.html from root of the install. This information file contains the version of WordPress right there at the top. It is common to find the version of the installation through one of these two techniques. There are known security issues even in some of the most recent releases of WordPress core, so check the discovered version against the known vulnerabilities. Even if you are unable to find any good exploits for the version of WordPress core, knowing the installation is running anything older than the latest release indicates that the site may not be closely managed - in which case the chance of exploitation elsewhere has increased considerably. If you can browse /wp-content/plugins/ - the next step in the information gathering phase where we attempt to find installed plugins and versions becomes much easier! Discovering the account names of the users of the site, allows you to then attack the passwords of those users through the WordPress login form. We will go through attacking the password in the next section, for now lets enumerate the users of the site. The most common attack against the WordPress user is brute forcing the password of an account to gain access to the back-end of the WordPress system. Other ways a password can be compromised include sniffing the password in clear text over a HTTP login session or even getting the credentials from a key logger on the workstation of the WordPress administrator. With the usernames we collected during information gathering we can get started (or just try admin). Take a look at the login form /wp-login.php, notice how failed logins confirm the username when an incorrect password is entered. This is very helpful to an attacker.... it also makes things more user friendly for the end user who has forgotten their username and password. This "feature" has been debated and it has been decided to keep this response within the WordPress code. Lets review the output, 500 passwords tested against the 'testadmin' account (that was discovered during user enumeration). Those 500 passwords were tested in 1 minute and 16 seconds! While the test was running the site was still responding; a web server administrator would have no idea the attack took place without some sort of security log monitoring system in place (OSSEC does this very well). The '500 worst' password list used above is from Skull Security. The site has a large number of password lists including the 60mb rockyou list that contains many more than 500 passwords! Above are the results from brute forcing WordPress accounts using the http-wordpress-brute NSE script. For those familiar with web application security testing the Burp Suite Intruder tool can also be used for brute forcing WordPress passwords. 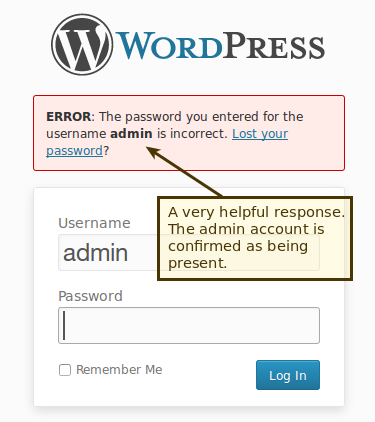 A WordPress login attempt is simply a POST request after all. Without additional security measures in place (SSL), accessing the /wp-admin/ dashboard is over an unencrypted connection. This means if you login to your WordPress site on an unsecured network such as the wireless at your local coffee shop or airport your login and password to manage the site could be captured by an attacker simply by watching your session. Plugins, Themes and WordPress Core all contain a large amount of php code from developers around the world. These developers have differing abilities and focus when it comes to writing secure software. For this reason there are thousands of exploitable vulnerabilities available to an attacker. Updating plugins, the WordPress Core and Themes must be a routine task for any WordPress administrator to ensure the known vulnerabilities are patched. Common vulnerabilities include XSS, SQL injection, file upload and code execution. All of these can have devastating consequences to a WordPress site. Search through Metasploit and exploit-db.com for lists of exploitable WordPress bugs. The best tools for brute forcing the installed plugins are similar to those used to brute force passwords. The WPScan tool has the option to search for all plugins, the most popular plugins or only the vulnerable plugins. An Nmap NSE script is also available for brute forcing plugins. Note that brute forcing thousands of plugin paths will result in thousands of 404 Not found entries in the web server log file. Plugins and Themes that have been installed but are not enabled, can still introduce vulnerabilities as the bad code may be directly accessible through the web path. An example of this would be a vulnerable upload function, that allows local or remote file includes. Even though the plugin / theme is not enabled the upload function still works via direct access the php file in the web path. Brute forcing the location of these vulnerable files is a very common attack by scanning bots. Testing the WordPress application itself is only one part of ensuring your web site is secure. The server that hosts the website must also be kept secure. A successful brute force attack against a server management account will give an attacker full access to the server and the WordPress application. To reduce the chance of management account compromise the normal rules apply. Use strong passwords everywhere, do not re-use them! Exploitable security vulnerabilities can be present in server software or the operating system. Examples can be found on any vulnerability mailing list, recently SQL Injection exploits have been used successfully against WHMCS a very popular web hosting control panel software. PHPMyAdmin has long been a favorite application to attack, due to its popularity and a long list of vulnerabilities. Often times security vulnerabilities can be introduced purely through misconfiguration of a service or poor management practice. These tools can be used by attackers and defenders to find security issues on the target server. The three below are examples. There are many other security testing tools that can be used to find vulnerable systems; both commercial and open source. An open source vulnerability scanner with a collection of plugins that number close to 30000. The plugins test many different aspects of a system or network device. Test for open ports and how effectively a firewall is protecting a system with the well known Nmap Port Scanner. A well configured firewall that only allows access to required services makes an attackers job much harder. A vulnerability scanner that focuses on a web server and looks for known vulnerable scripts, configuration mistakes and other web server items of interest. The Nikto tool has been around for many years yet still has a place in the penetration testers toolbox. There are many reasons why WordPress sites are attacked. Understand that it does happen, and do not be the low hanging fruit. Keep everything up to date, keep regular backups, perform basic hardening and if you derive an income from it..... test your security regularly and have visibility with real time monitoring (such as OSSEC). Take a look at the follow up post to this article Defending WordPress with OSSEC. hey, I was wondering if you were offering tutoring/helping or teaching(per hour)? If you do, it would be my pleasure to potentially be your client! yeah it is.. looking for a spoon feed? Great article. Wish more people would harden their sites. Didn't like it much. Its not the way sites are hacked. AbisuX yes, that is one of the many methods that most PHP sites are hacked. Just take a look at any honeypot report and access log file. Its all bruteforce, XSS, and SQL injection attacks. The best way to defend against any of this is to harden your firewall, server, and install a WAF like NAXSI or Mod_security. Plus, ensure your regularly updating your software with security patches and run malware scans on anything you didn't create yourself. Why did you not try Plamch? You don't get that far on any of my sites. LOL! I'm reading this article for secure my website. Thanks Great article. So, how do you by pass an ip block??? That is, if you can't access the admin area in the first place.